Myopia is becoming a real public health concern across the world. The number of myopic people is increasing rapidly. The prevalence of high myopia is also expected to rise. Understanding myopia development and methods to slow its progression is currently one of the biggest stakes for researchers and clinicians from around the world. In this paper, a few Vision Scientists at Essilor have put together a general overview of myopia condition. In this article they review the definition of myopia, its evolution and causes. They describe available solutions for myopia management and discuss the relative efficacy for each solution. Finally, they focus on Myopilux®, the specific range of ophthalmic lenses which have been proven to effectively correct and control myopia progression in children. Although high rates of myopia have been reported in some Asian cities for years, recent publications have highlighted the importance of and increases in this condition throughout Asia, as well as in the US and in Europe. As a result, the number of myopic people is expected to exceed a third of the world’s population by 2020, or 2.5 billion people out of a total population of 7.6 billion. The loss of quality in vision, not only affecting daily life, has also raised the biggest concern due to an expected increase in eye pathologies and blindness associated with the severity of myopia. Therefore, it is of great importance to understand myopia development and methods to slow its progression. In this paper we focus on: 1/ Myopia definition, evolution and causes, 2/ Available solutions for myopia management, 3/ Myopilux® new range of ophthalmic lenses for myopic children. A recent Asian meta-analysis of 50 studies covering countries from Iran to Japan has reported an average myopia rate of ~28%, with strong disparities based on age and geographical region. The highest prevalence is reported among urban young people in Korea, where the rate reaches 96.5% among 19-year-old adults, whereas in Beijing, the prevalence of myopia is 74% among 17- to 18-year-olds. On the other hand, the rate is as low as 5.0% among schoolchildren in rural China (5-18 y.o.) and 10.8% among the 15-year-olds in New Delhi. In the US, the literature highlights an increase in myopia, with its prevalence among 12- to 54-year-olds increasing from 25.0% between 1971-1972 to 41.6% between 1999- 2004; the highest rate is reported to be 44.0% among 25- to 34-year-olds between 1999-2004. More recently, in Europe, the prevalence of myopia has been estimated to be 30.6% among 25- to 90-year-olds, with the highest prevalence of 47.2% observed in the 25- to 29- year-old age group. In most cases, myopia occurs because the eyeball is too long relative to the focusing power of the cornea and lens of the eye. This is called axial myopia. Figure 1 shows an emmetropic eye and a myopic eye. In an emmetropic eye, light rays from far objects are focused on the retina resulting in a clear image. In a myopic eye, light rays from far objects are focused in front of the retina resulting in a blurred image. In practice, without any correction, a myope experiences blurry vision when looking at far-away objects. The higher the level of myopia, the shorter the distance of clear vision from the eye. Typically, a -2.00 D myope will see clearly at approximately 50 cm, whereas a -5.00 D myope will see clearly only at approximately 20 cm. Myopia is a progressive phenomenon in which onset and strongest progression are mainly reported during childhood.On average, myopia progression rates are-0.55 D per year among Caucasian children, and at a higher rate of -0.82 D per year among Asian children. With such a rapid progression during childhood, the risk to become highly myopic in adulthood is high (currently, high myopia is defined as below -6.00 D). In Taiwan, the prevalence of high myopia has increased from 10.9% in 1983 to 21.0% in 2000 among 18-yea-rold students.In Singapore, the prevalence of high myopia increased from 13.1% between 1996-1997 to 14.7% between 2009-2010 among 17-29-year-old men.In Europe, a 5.9% prevalence of high myopia prevalence is reported among 15- to 19-year-olds olds, according to data collected in 2013. Therefore, it is of great importance to understand myopia development and to find ways to slow the progression of myopia during childhood. Myopia development during childhood (onset and progression) is due to multiple factors, which are commonly split into two groups: heredity and lifestyle, often referred to as nature and nurture. Regarding heredity, it has been shown that children with two myopic parents are on average two to three times more likely to be myopic than children with non-myopic parents.More specifically, genetic studies have identified numerous candidate genes and loci that may contribute to myopia development. Regarding lifestyle, near-vision-demanding tasks and limited time spent outdoors are known to influence myopia development. 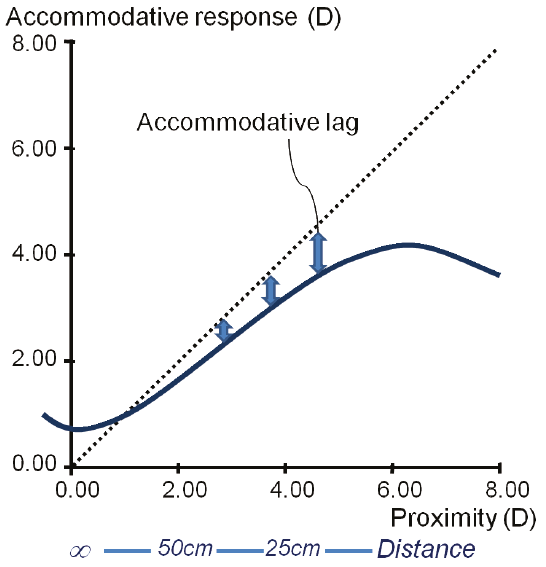 The accommodative lag increases with proximity (Fig. 4) and creates a stimulus for the eye to elongate, leading to myopia progression., ,  The risk of developing myopia increases as the working distance is shorter and the amount of near work is greater. 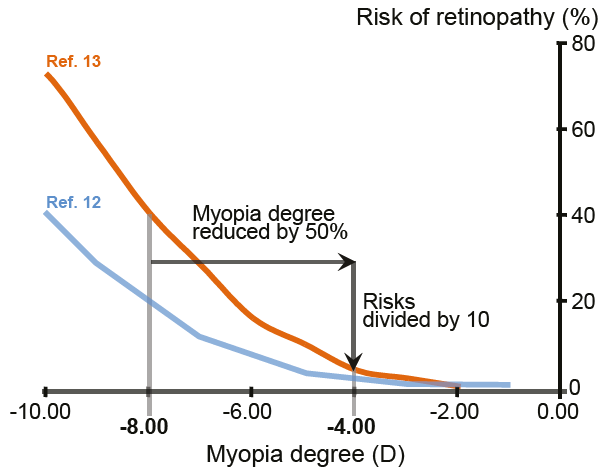 A large amount of near work combined with a lack of outdoor activities are also highly associated with higher myopia prevalence in children., ,  It is still unclear how outdoor activities impact myopia, and several hypotheses have been raised. Recent studies have suggested the existence of interactions between light conditions and myopia development. As light intensities are much higher outdoors than indoors, pupils are more constricted outdoors. This would result in a greater depth of field and less image blur, resulting in less myopia progression.Another hypothesis is the release of dopamine from the retina, which would act as an inhibitor for eye growth, and which is known to be stimulated by blue light in the range of 460-500 nm. With higher amounts of light outdoors, dopamine secretion would prevent the eye from elongating. In practice, modern lifestyle in cities, associated with limited outdoor activities and intense near vision tasks, favors myopia development. In particular, higher educational levels and hand-held digital device use tend to favor indoor work while exerting a higher demand on our eyes. For instance, research has shown that when using handheld video games, children adopt closer working distances, which in turn may favor myopia onset and progression. There are currently several options available to manage myopia. They can be classified according to their ability to correct and slow myopia progression during childhood as shown in Figure 5. Single vision lenses are the most common non-invasive solutions for myopia correction. Contrary to common belief, under-correction of myopia does not prevent it from progressing. One study showed that undercorrection of 0.75 D led to a 30% more myopic prescription after 2 years, which was statistically significant. Another study showed that undercorrection of 0.50 D led to a 21% more myopic prescription after 1.5 years. Other studies also showed that over-correction is not recommended for myopia control either.,  As a consequence, to correct myopia and to avoid the risk of more rapid myopia progression, full correction should always be chosen based on regular eye examinations. Contact lenses have long been used to correct myopia. However, the clinical efficacy of wearing standard soft contact lenses in myopia control has not been demonstrated. As an alternative, refractive surgery, such as LASIK, offers a proven solution for correcting myopia in adulthood. However, the method is invasive and does not control myopia or limit the risks of developing ocular pathologies linked to high myopia. 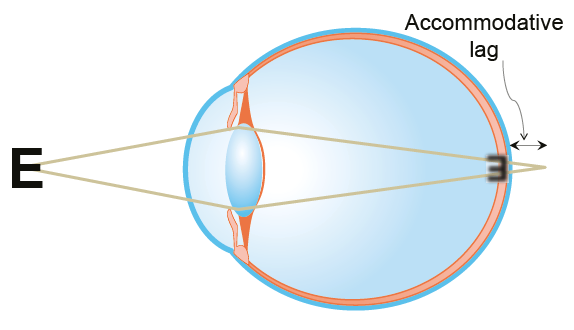 Indeed, refractive surgery modifies the shape of the cornea at the front part of the eye, but it does not change the axial length of the eyeball. The least invasive method for myopia control is undoubtedly to increase the time spent outdoors. A meta-analysis performed on the association between time spent outdoors and the risk of developing myopia in children has indicated that spending one hour outdoors per week during childhood reduces the risk of developing myopia by 2%: in other words, a child spending 10 hours more per week outdoors than another child has 20% less chance to become a myope later on. Atropine eye drops are also used in some countries in clinical practice to slow down myopia progression. Initially it had been suggested that paralyzing accommodation would result in less myopization, but later studies showed alternative mechanisms and sites of action for atropine at either the retina or the sclera. Atropine has thus been studied in several clinical trials. One of them compared several dosages of atropine. The high dosages (above 0.1%) were efficient during treatment but were associated with a myopic rebound after the cessation of treatment. The lowest dosage (0.01%) showed a moderate myopia slowing effect that was more sustained after cessation of the treatment. Unfortunately, this study did not include a control group to be able to quantify the effects. Moreover, in addition to its short-term side effects (photophobia due to pupil dilatation, and reduced accommodation power), atropine’s long-term side effects have not been documented in children to date. Ophthalmic lenses with near vision addition have been shown to be efficient in both correcting and slowing myopia progression and will be detailed in part 3. These lenses have dedicated additional optical power in the near vision zone that compensates for accommodative lag in the myopic eye while the upper part of the lens allows full myopia correction for far vision (Fig. 6). These lenses can either be prismatic bifocal lenses or progressive addition lenses with an addition value and a design adapted to children’s physiology. As of today, an addition value of 2.00 D has been shown to be the most efficient compared to lower addition values for myopia control,with up to 62% reduction in myopia evolution for prismatic bifocal lenses. 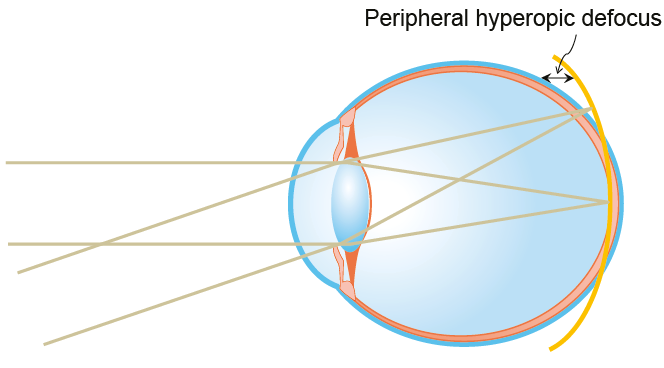 Other ophthalmic lens designs, such as peripheral addition lenses, have also been studied. The elongated shape of myopic eyes results in a defocused image in the periphery even with a perfect central focus (Fig. 7). It has been shown that this can cause elongation of the eyeball. 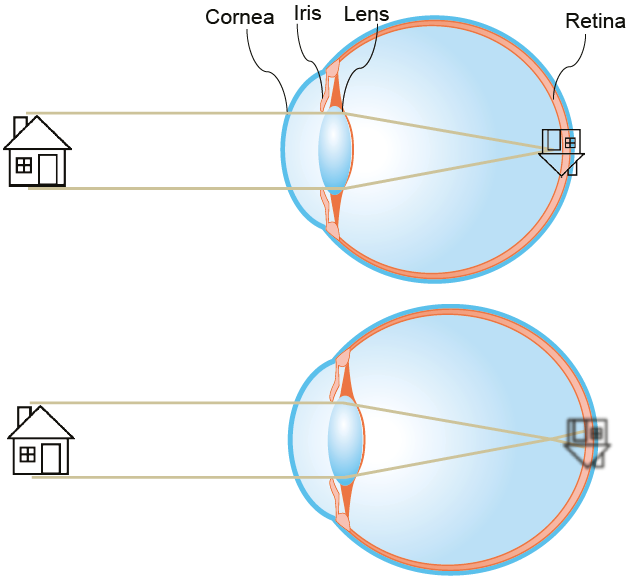 Peripheral addition lenses are thus intended to compensate for the peripheral hyperopic defocus and include two visual zones: the central zone of the lens allows full myopia correction and the peripheral zone of the lens presents a power addition for correcting the hyperopic defocus. In the main study conducted on this concept, no statistically significant differences were observed with the new designs compared to single vision lenses. However, for the subgroup of younger children with at least one myopic parent, myopia progression was reduced by ~30.Nonetheless, it was only a one-year study. Moreover, a two-year clinical trial showed that peripheral addition lenses do not enhance the therapeutic efficacy in slowing myopia progression versus near vision addition lenses only. As an alternative, in recent years, various multifocal contact lenses have been designed to retard the progression of myopia. 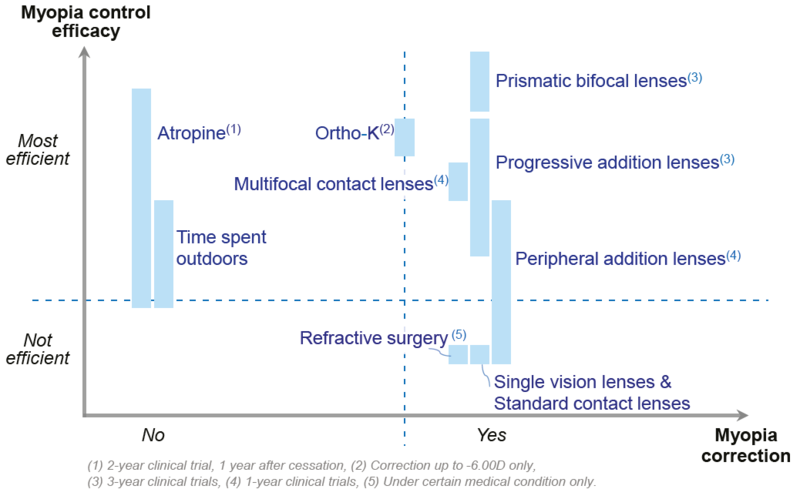 Two one-year studies have shown a reduction of ~35% in myopia progression with multifocal soft contact lenses.,  Although these studies showed promising results, there are no available results beyond the first year, thus no evaluation of rebound risks upon the cessation of wearing multifocal soft contact lenses. Several new clinical trials are currently in progress. Another option is Orthokeratology (Ortho-K), also known as corneal reshaping. 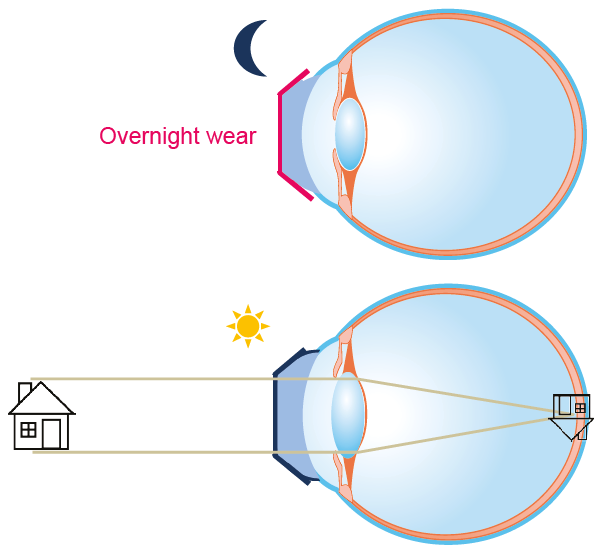 The patient wears rigid contact lenses overnight, with a specific reversed geometry; this flattens the cornea temporarily to push the focal point back to the retina (Fig. 8). With a proper fitting protocol, Ortho-K can correct myopia up to -6.00 D during daytime. Several recent meta-analyses also showed that Ortho-K slows down myopia progression by approximately 40% with careful education and regular monitoring to ensure safety., , Nonetheless, the long-term efficacy (including a possible rebound effect) as well as the long-term side effects have not been assessed yet and should be evaluated through further large-scale studies. Myopilux® is an all-in-one non-invasive range of near vision addition ophthalmic lenses for both myopia correction and myopia control throughout childhood. Resulting from more than 10 years of exploratory research by Essilor International myopia experts, Myopilux® lenses are based on a deep understanding of myopic children’s natural posture and physiology to ensure good ergonomics and comfortable vision and provide a non-invasive solution for myopia control. that when performing near vision activities, children adopt a closer working distance than adults, leading to higher convergence between far and near vision tasks, and that children also prefer to use head over eye declination. These findings were taken into consideration when designing the lateral and vertical positioning of the visual zones in Myopilux® lenses. Regarding children’s physiology, the Myopilux® range has been defined by taking into account children’s near phoria: esophoria (tendency to “over convergence”), and exophoria (tendency to “under convergence”) (Fig. 9). 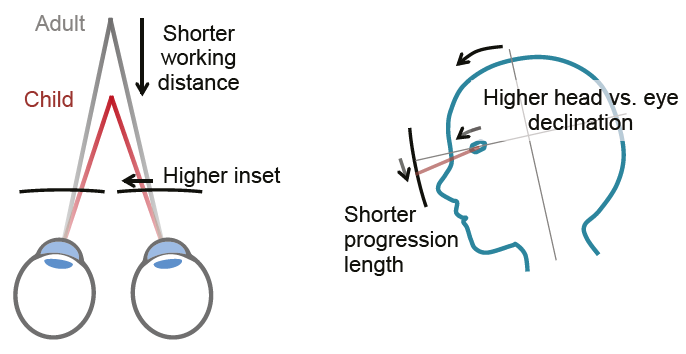 When wearing near vision addition lenses, as accom-modation drives convergence, the reduction in accommodation will result in less convergence in the eyes, meaning an exophoric shift. 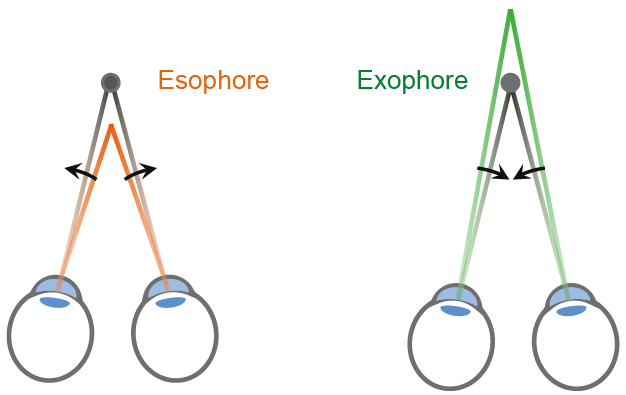 For esophoric profiles, near vision addition lenses will be comfortable because the exophoric shift induced by the addition will partially compensate for their natural esophoria. However, for exophoric profiles, near vision addition lenses lead to discomfort as they add exophoric shift and require a higher fusional vergence demand. Nonetheless, it has been shown that near base-in prisms can reduce the exophoria induced by near vision addition lenses. More precisely, a 3D base-in prism combined with a +2.00 D near addition on each lens brings visual comfort to the child, with a phoria at its initial state. It results in an efficient usage of these near vision addition eyeglasses. Based on the above long-term exploration, as well as on sophisticated lens surface calculation methods, high performance production means and efficient methods for controlling lens manufacturing processes, the Myopilux® range of lenses is protected by six Essilor patents and is available in three product versions: Myopilux® Lite, Myopilux® Plus, and Myopilux® Max. Myopilux® Lite lenses are recommended for esophoric children with progressive myopia. Its design includes a progressive optical design, with a recommended addition of +2.00 D for better efficacy in myopia control (Fig. 10). The lens is adapted to children’s posture; its inset is higher and its progression length is shorter than those for adults. This is to fit to children’s closer working distance and preferred usage of head over eye declination (Fig. 11). by-point calculation. It ensures tailored lateral positioning of the whole visual zones for enhanced visual comfort and it provides the child with better visual resolution (Fig. 10). - The upper part of the lens offers the visual correction adapted to the prescription. - The lower part is dedicated to near vision with an addition of +2.00 D and 3D base-in prism. - The wide visual zones as well as the short segment height have been designed specifically for children. Myopilux® lenses’ concept has been validated through two major clinical trials with approximately 600 children, with third party ethics committees approval. The concept at the heart of Myopilux® Lite and Myopilux® Plus lenses was tested in the Correction of Myopia Evaluation Trial (COMET) study. The purpose was to evaluate the effect of progressive addition lenses (PALs) compared with single vision lenses (SVLs) on the progression of juvenile-onset myopia. A total of 469 children were recruited in this study. The children were randomly assigned to either wearing single vision lenses or PALs with +2.00 D addition. The children were monitored for three years with six monthly follow-up visits. The primary outcome measure was progression of myopia, which was determined by auto-refraction after cycloplegia. The retention rate was extremely high with only 1% dropout rate. At the end of three years, the overall PALs group had a statistically significant reduction of 14% in myopia progression compared with single vision lenses (SVLs) that served as a control. However, a better effect of the PALs was observed in esophoric children with high lags of accommodation, whereas there was a statistically significant reduction of 37.2% in myopia progression compared to the SVLs group. The concept of the Myopilux® Max lens was tested in a 3-year clinical trial. The objective of this study was to determine whether bifocal and prismatic bifocal spectacles control myopia progression in children with high rates of myopia progression compared to SVLs. A total of 135 children aged seven to 13 years old were recruited and randomly assigned to wear SVLs, bifocal and prismatic bifocal lenses. The children were monitored for three years with visits every six months. The primary outcome was cycloplegic auto-refraction and the secondary outcome was axial length growth. The two-year and three-year results were published in the Archives of Ophthalmology in 2010 and in the Journal of the American Medical Association Ophthalmology in 2014. At year two, the progression of myopia in children wearing prismatic bifocal lenses was reduced by 55% compared to children wearing SVLs. This difference was highly significant. The best results were seen in the exophoric group of children; those in the prismatic bifocal group had a reduction of 62% in myopia progression compared with those wearing SVLs. At year three, children in the prismatic bifocal group had their myopia progression reduced by 51% (Fig. 12). Moreover, contrary to other myopia control spectacle lenses, prismatic bifocals were efficient in slowing myopia progression for all children in different age groups, near phoria types, lag of accommodation or number of myopic parents. Fig. 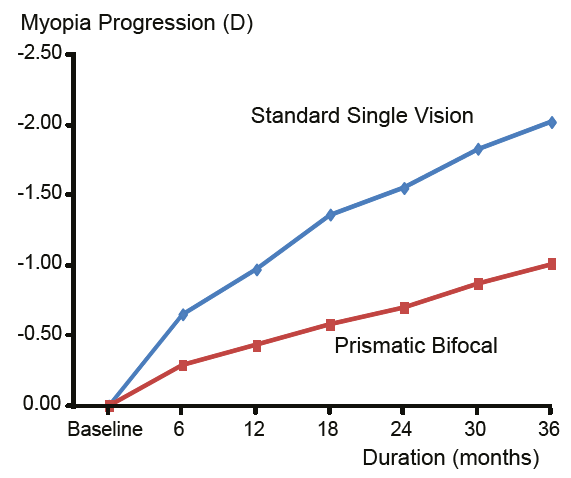 12: Myopia progression of children wearing bifocal prismatic addition lenses vs. single vision lenses over three years. Based on the current scientific state of the art and the scope of clinician’s practice, a number of options for myopia correction and myopia control are worthy of consideration. As far as non-invasive solutions are concerned, ophthalmic lenses such as Myopilux®* can be prescribed for effective myopia correction and control. • Myopia is a progressive phenomenon in which onset and strongest progression are mainly reported during childhood. • Myopia development during childhood (onset and progression) is due to multiple factors, which are commonly split into two groups: heredity and lifestyle, often referred to as nature and nurture. • Regarding heredity, it has been shown that children with two myopic parents are on average two to three times more likely to be myopic than children with non-myopic parents. • Regarding lifestyle, near-vision-demanding tasks and limited time spent outdoors are known to influence myo-pia development. - Solutions that correct myopia and control myopia progression are: ophthalmic lenses with near vision addition (such as Myopilux® offer), various multifocal contact lenses and Orthokeratology (Ortho-K). • Resulting from more than 10 years of exploratory research by Essilor International myopia experts, Myopilux® lenses are based on a deep understanding of myopic children’s natural posture and physiology to ensure good ergonomics and comfortable vision. 31 Rose KA, Morgan IG, Ip J, Kifley A, Huynh S, Smith W, Mitchell P. Outdoor activity reduces the prevalence of myopia in children. Ophthalmology. 2008 Aug;115(8):1279-85. 32 Dharani R, Lee CF, Theng ZX, Drury VB, Ngo C, Sandar M, Wong TY, Finkelstein EA, Saw SM. Comparison of measurements of time outdoors and light levels as risk factors for myopia in young Singapore children. Eye (Lond). 2012 Jul;26(7):911-8. 33 McCarthy CS, Megaw P, Devadas M, Morgan IG. Dopaminergic agents affect the ability of brief periods of normal vision to prevent formdeprivation myopia. Exp Eye Res. 2007 Jan;84(1):100-7. 34 Bao J, Drobe B, Wang Y, Chen K, Seow EJ, Lu F. Influence of Near Tasks on Posture in Myopic Chinese Schoolchildren. Optom Vis Sci. 2015 Aug;92(8):908-15. 40 Sherwin JC, Reacher MH, Keogh RH, Khawaja AP, Mackey DA, Foster PJ. The association between time spent outdoors and myopia in children and adolescents: a systematic review and meta-analysis. Ophthalmology. 2012 Oct;119(10):2141-51.